Adding a skylight will bring more natural light into your home. A skylight will also make your rooms feel more spacious. Corriveau Contracting has been installing quality VELUX Skylights for over 15 years. VELUX is the world’s premier skylight manufacturer. VELUX Skylights are designed for overhead, out-of-reach applications or for in-reach applications that do not require egress emergency exit capability. Corriveau Contracting can complete your skylight installations with VELUX accessories including blinds, shades, and electric controls that are designed to enhance the functionality and enjoyment of your VELUX skylight. VELUX Sun Tunnel Skylights are an innovative and affordable way to bring natural light into almost any space in your home. A Sun Tunnel is ideal for small rooms such as closets, hallways, bathrooms, and other areas where traditional skylights are not an option. Sun Tunnels are available in both flexible and rigid tunnel designs. 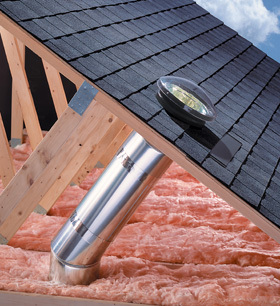 VELUX Skylights are Energy Star rated for efficiency and feature double-pane glass with low-E coatings and Argon gas fillings for max energy efficiency. For a free estimate, call us at 603-880-9988.